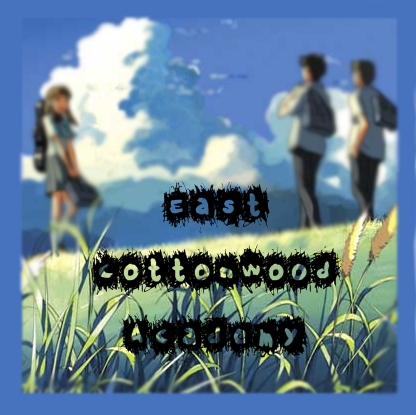 East cottonwood academy :: Other topic disscussion :: Questions? ask them here! May we make new topics in places (i.e. not classes) because I'm getting awfully confused in the area where there are about 20 characters showing up. It's just insane and coplicated - In other roleplay I'm used to haveing one character with another chatacer and on some occations a third shows up. I feel just the way you do. I guess this is how school RPs are. For the dorms, it's just because it hasn't been decided yet who is sharing a dorm with who. So it would be perfectly fine (I believe) to make new topics and wait for someone to come and share a room with your character, though I believe that it would be best to have a character from someone else share a dorm. But for the classes, like spell training, or at lunch times, I don't think that 2 topics would be good. I mean, the cafeteria isn't separated, is it? Everybody is in one large hall. This doesn't mean you would have to notice everything that's going on in the cafeteria, unless it affects you. Hope I helped clear this up a bit? Dragon should be a mod! She's ideal for that job! good idea, what do you think, dragonzdaughter? Wanna b a mod? I think classes should be all one topic, but in the cafeteria, couldn't it be one topic per table? Otherwise if 2 groups are trying to have a conversation it would get annoying. that is kinda true... So next time it is "Lunch time" i will change that. Well this question is praticly answered so there's now a reason to spam it! haha P!nk for the win! Oh and I like James Blunt, Avril Lavigne, Green day and Paramore! You?